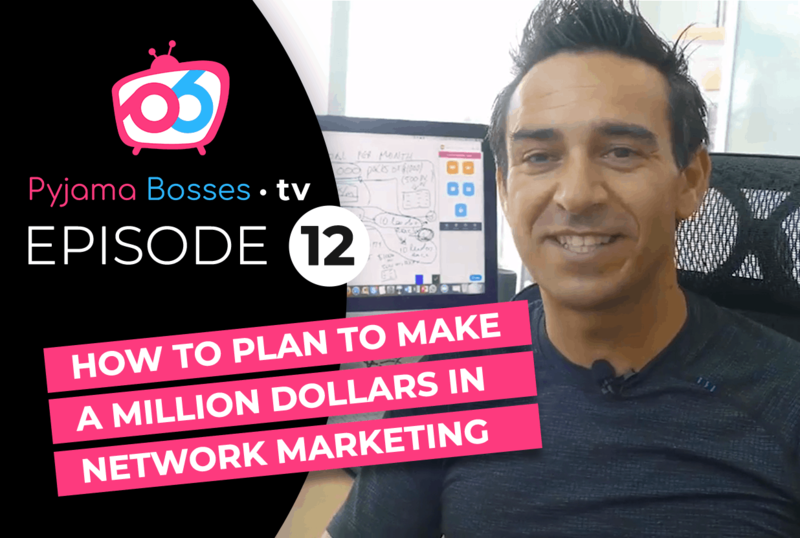 Hey Pyjama Bosses this is Masa back with you and in this episode of Pyjama Bosses TV we’re going to talk about how to create a six figure network marketing business. If you’re excited about creating a business that gives you six figures or more per year, then come with me and let’s learn what are the three steps to do that. Welcome back. In this episode of Pyjama Bosses TV I’m so excited to be sharing with you mission, six figures per year. And actually, this is a part of the four episode series about how to create a six figure network marketing business. In the next four episodes I’m going to be sharing with you what I would do right now if I were starting a brand new network marketing business. And the reason I’m doing that is, because I get asked this question so often that I wanted to make a training for you so that you can replicate this and go ahead, and really create the results that you deserve. So, let’s get started. In this first episode we’re going to talk about what the three steps to create a six figure business actually are, and how I would prepare myself should I have to start in a brand new network marketing business tomorrow. In fact, we’re going to talk about how I would prepare myself before actually start to prospect people, before I were to start to share the information about the business, the product, and the opportunity. What are the three essential steps to set yourself up for success? In the next three episodes I will be going through each of the three steps in detail, so pay close attention. This can potentially really revolutionise about how you’re thinking about your business, and you know what? Preparation is everything. Even Einstein himself said it, he was not smarter, he just spent a longer time thinking about the problem. And so, if you think about your six figures in your network marketing business as the goal, as the problem, as the challenge that you set yourself to do, then why not give yourself some time to plan around it before you actually go ahead and do it? And so, you know, typically this is a great exercise to do every quarter, every month, but sometimes even every year as you’re embarking on a new year. So, lets get started. So, in this first video I want to review really, what I would do right now you know, should … You know, should I find myself in a situation that I would be starting a brand new network marketing business. And before I even you know, with all the enthusiasm, and excitement of having a brand new business, leap into massive activity, which we all know is the difference that makes all the difference. Before I would do that, I would have clarity in my mind, and I’m going to take you through the three steps, what those three steps are today and as you heard, in the next three episodes we’re going to dive deep into the details of each of these steps. So, let’s have a look. The first steps here … The first step here is actually to create a strategy. We all know that you know … Strategy. We all know that having a strategy is 90% of success. You know, actually taking action without having an exact strategy and focus can actually you know, make you actually take a much longer time to achieve a certain goal. What does it mean to have a strategy? And we’ll go into this in the next video in detail, is asking yourself things like you know, “What is that exact package that I will be promoting? How can I make $1,000 a month? $10,000 a month within this compensation plan?” Or things like you know, “Exactly how am I going to be doing this business? What are the tools that I will be using?” So, having a strategy around what you’re going to be doing and how you’re going to be getting to $10,000 per month or more, or $100,000 per year more, is the first step. So, you really need to think about the strategy you know? You need to have the clarity of what it takes in that business to achieve $100,000 a year, or you could achieve $100,000 in less than 12 months and that still would be good right? So, first think about a strategy. Not only that, “How am I going to be training my team? What are the three steps to get a brand new person started?” So, there’s a lot of processes in network marketing and a lot of leaders actually understand this extremely well, but where they get it really wrong is they mistake process for the next step, which we’re going to get into a moment. So, onc we have a strategy you say, “Look, this is what it’s going to take for me to create a $10,000 per month or $100,000 per year business in this company, in this brand new opportunity. Here is how I’m going to do it. Strategy.” Now, process, “What is the process that I am going to use on a daily basis? What’s my DMO, daily method of operation going to look like?” That is the second step. The process. And then the final step in this technology age with so many tools, and so many platforms and different things is of course, to automate parts of your process into a, my favourite word of course, into automate it into a system. And like I was saying just before, a lot of leaders actually mistaken process for system. A lot of people think they have a system, but what they in fact have is a process. You see, if you don’t do this step three, you are not going to be able to have significant leverage to accomplish this in a really short amount of time. Right? And this is why we see today in network marketing, we see leaders who are brand new to network marketing actually being able to come in and crush it, because guess what? They not just understand the importance of a process, but they’re using systems and they’re leveraging their time, and creating leadership in a lot faster way. So, these are the three steps you know, so let’s repeat. So, if you are going to set yourself out on a new business, in fact, consider yourself for a second in your own network marketing business just as if tomorrow you were starting for scratch again. And you know what? This is actually a planning process before you leap into massive action. And you know, when you have the clarity of this you will see when you have this actual planned out, it is very simple to go ahead and complete it. And so, what I see is you know, people who take the longest, who struggle the most, who get the most frustrated to create six figures a year in network marketing, are the ones that don’t have this planning process. You know, they leap into this enthusiastic massive action but guess what happens? If you don’t have clear focus, if you don’t have clear processes, systems, then very often you reach a plateau, you reach a frustration level, because you can’t increase your income and then you’re just one step from the worse, which is giving up on your dreams. So, this is what we wanted to cover today. You know, it’s really about, when you embark on the mission to create six figures go through first, planning the strategy, then the process, and creating a system and now, when you go to the next video, part two, we’re going to go dive deep into the strategy. So, come with me to the next video and you know what? Some of you may be actually waiting for the video yet to be released so stay patient before we go ahead and release the next step, which is all about, what does it require to create a strategy before we leap into the activity of creating a six figure business. So, I hope you enjoyed this, I hope you go ahead right now and take action on what you learned, and make sure that if you enjoyed this video you let us know. Comment below, share this video with your team and colleagues, and I’ll see you again in the next video.